Thank you for your interest in worshipping with Congregation Or Ami for our High Holy Day Services. 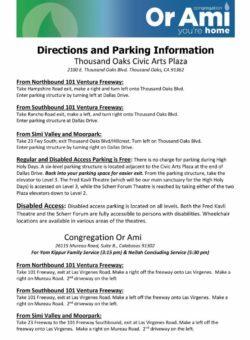 Most services are held at the Thousand Oaks Civic Arts Plaza in the Fred Kavli Theatre, Thousand Oaks. 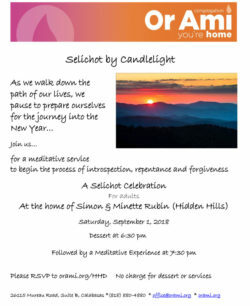 Rabbi Paul Kipnes, Cantor Doug Cotler and Rabbi Julia Weisz will officiate inspiring musical services. 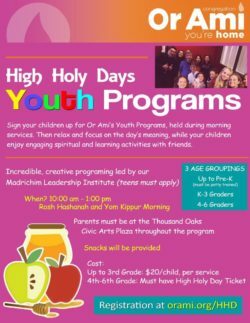 Evening and morning services for Rosh Hashana and Yom Kippur require tickets for each worshipper. 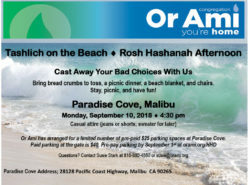 Family services in the afternoon, Tashlich, and Neilah (concluding) services do not require tickets. 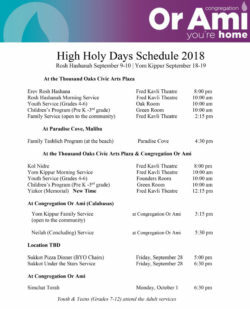 See our High Holy Day Schedule for times and dates.